Dec 21 This post is part of the 2009 performance advent calendar experiment. Stay tuned for the articles to come. Perceived page loading time is just as important as the real loading time. And when it comes to user perception, visible indication of progress is always good. The user gets feedback that something is going on (and in the right direction) and feels much better. Using multiple content flushes allows you to improve both the real and the perceived performance. Let's see how. Doing something like this will result in shorter waterfalls, because more downloads can happen in parallel. In the waterfall below the page is not yet completed at 0.4 seconds, yet the browser has already requested more components. Here's an example - Google search results. The header part of that page (chunk #1) doesn't need any complicated logic. True, the page title and pre-filling the input box are dynamic parts, but this is just a simple echo of the user input, nothing that requires complex work. So out goes the header. Notice that the number of search results is not visible yet. In this chunk there's the logo, so the sprite is downloaded. If this page was using external CSS, it would be included in the head too. Then, the search results, the meat of the page. Out it goes, as a static HTML chunk #2. So how does this work actually, how come the HTML is served in parts? Amazon is an interesting example of doing a mix of both strategies - it looks like sometimes it's server level (e.g. in the middle of an html tag) but sometimes it looks like the chunk contains (or wraps up) a page section. 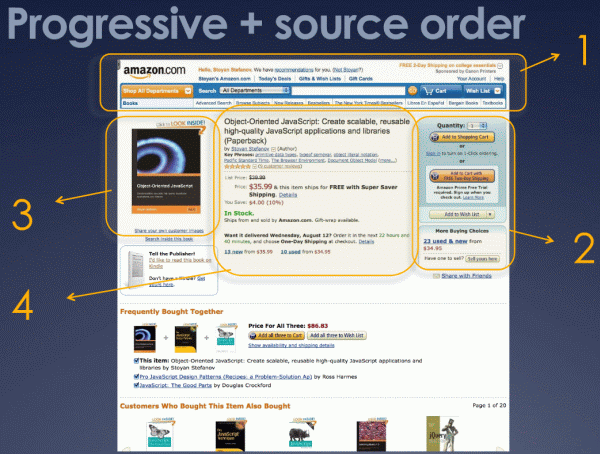 Amazon is also a good example of focusing on what's important on a page (Why is the user here? What do they want? What do we want them to do?) and making sure it's rendered first. #1 - header. Every page has one. Get done with it. #2 - buy now. This is what we want the user to do. #4 - title/price. Kind of important too. The rest of the page - reviews, comments, also buy... all this can wait, it's all secondary. Most of it is way below the fold anyway. Unfortunately, as far as I know, there's no tool that offers visibility into those chunks - what is the contents of each one and how does it looks like. Fiddler let's you see the encoded chunked response, but that doesn't help too much. 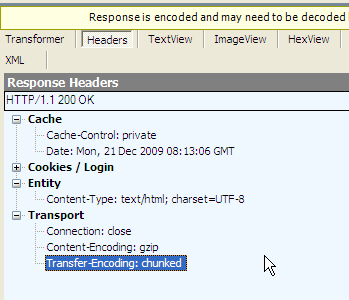 At least it gives you an idea that the response was chunked - you can see under Inspectors/Transformer that there is a "Chunked Transfer-Encoding" checkbox. 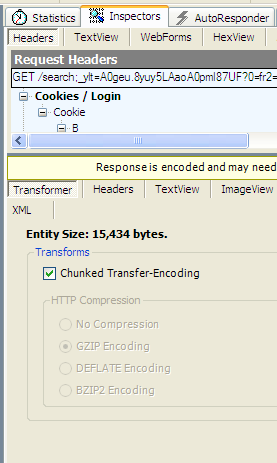 HTTPWatch let's you see the incomprehensible response, but it also tells you the number of chunks. Note that the number includes the last 0 in the response, so when it says 4 chunks it means actually 3. I also tried to fill the void in the tools department by attempting a Firefox extension. Unfortunately it didn't work, I couldn't find API exposed to extensions that would give me access to the raw encoded response. Looks like it would be possible as an extension to HTTPwatch or Fiddler though - both offer extensibility, both show the raw response. For own consumption I did a PHP script to request the page and give me the chunks ungzipped. It's very primitive but you can give it a shot here. 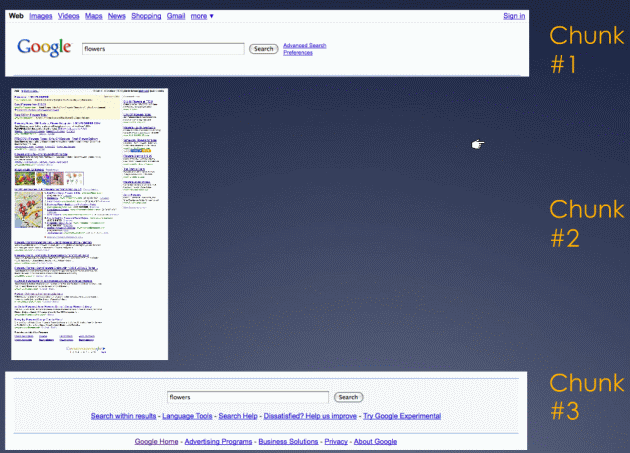 Test with Yahoo! Search for example. A common concern is whether chunked encoding works together with gzipping the response. Yes, it does. In this presentation Steve Souders sheds some light (PPT, see slide #66) on how to address common issues and also gives flush() equivalents in languages other than PHP. It may be tricky to implement multiple (or even single) flushing, but it's well worth it. There's some server setup hurdles when it comes to gzip, but once you figure it out, you only do it once. As a reward you get faster loading times, plus progressive rendering so your page not only has faster time-to-onload by feels that way too.